Members of particular communities produce and reproduce cultural practices. This is an important consideration for those teacher educators who need to prepare appropriate learning experiences and programs for scientists, as they attempt to change careers to science teaching. We know little about the transition of career-changing scientists as they encounter different contexts and professional cultures, and how their changing identities might impact on their teaching practices. In this narrative inquiry of the stories told by and shared between career-changing scientists in a teacher-preparation program, we identify cover stories of science and teaching. 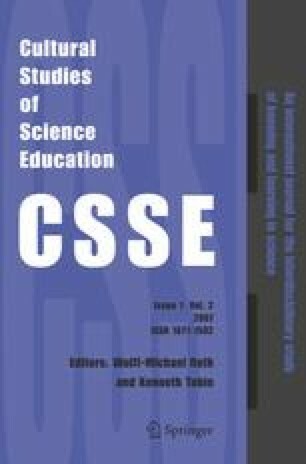 More importantly, we show how uncovering these stories became opportunities for one of these scientists to learn about what sorts of stories of science she tells or should tell in science classrooms and how these stories might impact on her identities as a scientist–teacher in transition. We highlight self-identified contradictions and treat these as resources for further professional learning. Suggestions for improving the teacher-education experiences of scientist–teachers are made. In particular, teacher educators might consider the merits of creating opportunities for career-changing scientists to share their stories and for these stories to be retold for different audiences. We acknowledge Dr. Jan Millwater’s contribution to the production of the promotional DVD in which Tanya featured and some support for research-assistance funds from the QUT Teaching and Learning Large Grant called: “Transition to Professional Practice.” We also wish to thank Emeritus Professor Campbell McRobbie for his comments on a previous draft of this article. Mackay, J. (2002). An interview with Dr. Joel Mackay, biochemist. Interviews with Australian scientists program. Canberra: Australian Academy of Science. Retrieved May 10, 2006 from: http://www.science.org.au/scientists/mackay.htm.